*Updated 8/16 with Editable files and more! Read below or look at the Preview to info. 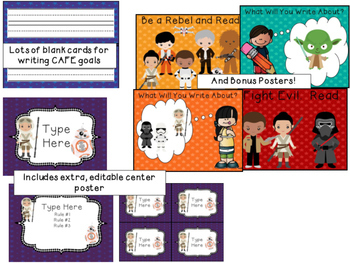 This package contains everything you need for using Daily 5 and CAFE in your classroom with a Star Wars theme! This package contains PDF files and Editable PowerPoint files. Please make sure you can open both. Pages 1-5 are the “The students are…” “The teacher is…” posters for implementing the program. Pages 6-10 are posters with each of the Daily 5 headings. These could be used on a bulletin board or on tables. Pages 11-15 are the Daily 5 posters with the rules. Pages 16-20 are small Daily 5 posters that could be used for labels on drawers and shelves where the supplies are kept. They could also be used for mini posters around the room. Pages 21-24 are helpful posters that go along with Daily 5: I PICK, 3 Ways to Read a Book, Finding a Just Right Book, EEKK. Page 25 contains five different bookmarks you can give to the students to ensure they are starting at different stations. Give each student a clothespin and they start at the top and work their way down. This also ensures they are doing each station. The next day they come back and start where they left off. Page 26-27 is student recording sheets where the student checks off which station they have done throughout the month. Then both the student and teacher can see what they are accomplishing. In color and black & white. Pages 28-33 are teacher recording sheets where the teacher checks off what each student has done during the week. In color and black & white. Page 34 is a student self-assessment for daily 5. After a session, have the students complete the rubric and add their score on the bottom out of 12. They also tick off what they have done that day. I use this about once every two weeks. Page 43-46 are heading posters for CAFE. Page 47-51 are bonus reading and writing posters. These can be used in the reading corner and writing idea center. Page 52-64 are lined paper for writing the CAFE goals as they are being taught. The 2 Sisters say the students get more out of the program if they write the goals down themselves, so there are plenty of backgrounds to choose from. Page 65-67 are bonus Math Daily 3 posters. 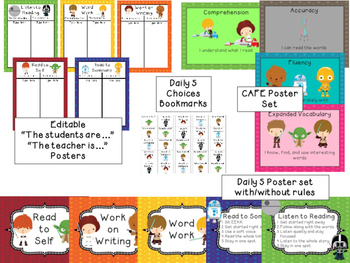 Pages 1-5 are the Editable “The students are…” “The teacher is…” posters for implementing the program. 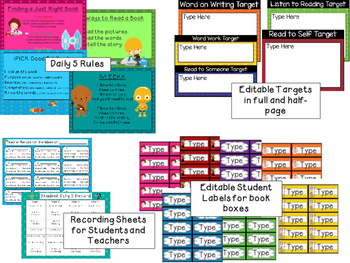 Pages 6-19 are two different versions of Editable Name Labels for labeling individual book boxes. Pages 20-27 are Editable Target Sheets for each strand of the Daily 5. Type and print what you want students to focus on for their lessons on either the full or half-page size. Pages 28-33 are the Editable Teacher Recording Sheets where the teacher checks off what each student has done during the week. In color and black & white. Pages 34-36 are Editable Extra Round Pages. These were made by request for teachers who wanted a “Work with Teacher” or extra editable round. And you can also move the text boxes! You can not move the clipart/frames/backgrounds due to copyright. 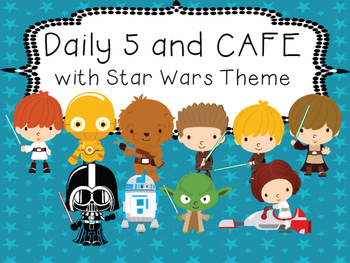 I hope you enjoy this Star Wars Daily 5/CAFE package! “The Daily 5 and CAFE are trademark and copy written content of Educational Design, LLC and The 2 Sisters. Educational Design, LLC and The 2 Sisters does not authorize or endorse these materials."